Halloween is the only time of year when kids can run around you with wings and masks and you need not bat an eye. It’s also the only time you hope your children ask for a literal handout. The biggest concern isn’t the “strangers” that they’ll be meeting in your neighborhood, but rather all the candy they’ll inevitably get. They are a little too young to think about their teeth, so as a parent you must. You don’t want to ruin the holiday and take the candy away, so what can you do? 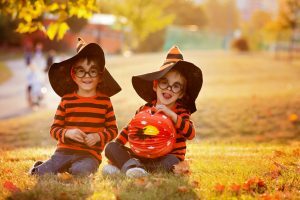 Your children’s dentist in Waco, TX from Premier Family Dental has a few tips for you this Halloween. You’ve probably known since an early age that too much sugar can give you a cavity. It’s a big reason why you’ve tried to teach it to your kids. Of course, this kind of flies in the face of a holiday where they will try to get (and eat) as much candy as they can. It’s possible to have the best of both worlds, however, so you can celebrate the holiday and also keep their teeth healthy. The number one thing they can do is brush and floss consistently. No matter what day of the year it is, routine home oral care is the best way to prevent most dental issues from ever developing. Brushing and flossing breaks up and cleans off the plaque that is left on their teeth from the food they eat, more specifically the sugar. In a time where your kids will be exposed to a lot of candy, these dental habits become especially important. Want to know what else you can do during Halloween to keep your child’s teeth healthy? Simply call your family dentist in Waco, TX, Dr. Rick Cofer. Sometimes speaking directly to a dentist helps a child listen to what they need to do to take care of their teeth. Be sure to have fun this Halloween, and remember to brush and floss your teeth! by: Dr. Rick Cofer at October 13, 2016 .